The 2019 Grammy Awards were handed out last night (Feb. 10) in a live ceremony which was hosted by 15-time Grammy winner Alicia Keys. A star-studded roster of performers hit the Grammy stage and the biggest and brightest stars were recognized for their outstanding musical achievements in the past year. Overall, the 61st Annual Grammy Awards ceremony proved itself to be an unforgettable night from start to finish with surprise guests joining Keys on stage to deliver some epic, inspirational speeches and many hot collabs including a sizzling Camila Cabello opener featuring Ricky Martin, Young Thug and more as well as Dua Lipa and St. Vincent performing a duet and several tributes to some legendary artists. As for awards, an absent Childish Gambino made history as the first rap artist to win Song of the Year for “This is America.” He also won Record of the Year, Best Music Video and Best Rap/Sung Performance for the chart-topping track. Dua Lipa won Best New Artist and country superstar Kacey Musgraves surprised everyone by taking home top honors for Album of the Year for her latest album Golden Hour. We’ve compiled a list of the seven best moments from the 2019 Grammy Awards below. 7. Alicia Keys and John Mayer drop a Grammy bombshell. First off, big props should be given to Alicia Keys for slaying her first-ever Grammy Awards hosting gig. She was personable, poignant and right on point throughout the evening. A touching and rather cute moment came when Keys admitted she was really bummed about losing out on Song of the Year for “If I Ain’t Got You” to John Mayer’s “Daughters” in 2004. She was shocked, in fact, when her hero Stevie Wonder, who was presenting the award, did not call out her name. 6. Diana Ross unites the crowd for her 75th birthday. 5. Shawn Mendes and Miley Cyrus perform “In My Blood” duet. 4. Alicia Keys delivers a stunning medley while playing two pianos at once. Speaking of the piano, we know Alicia Keys has amazing command of the ivories. But seriously, who can ever top the 15-time Grammy winner’s jaw-dropping feat of playing two pianos at one time?! Talk about crazy good! Not to mention the stunning medley of songs she sang that she wished she had written, including Roberta Flack’s “Killing Me Softly,” Nat King Cole’s “Unforgettable,” Drake’s “In My Feelings” and her own “Empire State of Mind.” It was epic. 3. Dolly Parton joins an all-star list of performers for her MusiCares tribute. Dolly Parton was honored as the 2019 MusiCares Person of the Year. A huge lineup of superstars joined Parton to perform a fun selection of her biggest hits. Katy Perry and Kacey Musgraves kicked it off with “Here You Come Again,” then she and her goddaughter, Miley Cyrus performed “Jolene” before Maren Morris came out to join them on “After the Gold Rush.” The iconic country songstress also joined Little Big Town and everyone performed an upbeat rendition of “9 to 5” to close. 2. Girl Power rules the school. Yes, there was an incredibly awkward moment when soon-departing Recording Academy President Neil Portnow addressed the audience and stressed inclusion and diversity in his speech. Some artists are still feeling the sting of his controversial remark that female musicians needed to “step up” to be recognized. But it was clear that girl power ruled the 2019 Grammys roost. Everything from the epic female-focused tributes for Aretha Franklin and Dolly Parton, to Michelle Obama’s surprise appearance, Cardi B’s history-making win and heartfelt Best Rap Album acceptance speech, Dua Lipa’s Best New Artist win, and Alicia Keys’ amazing hosting job, the ladies showed up and conquered the 61st Annual Grammy Awards in full female force. 1. Kacey Musgraves wins Album of the Year. 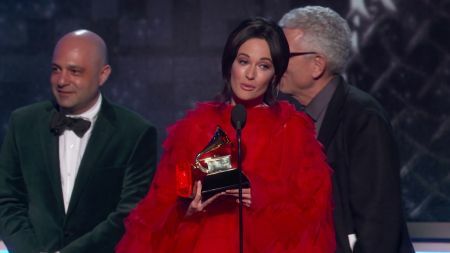 With such a diverse, hip-hop heavy category this year, it was a surprise to see Kacey Musgraves sweep the night’s top award of Album of the Year for her chart-topping third studio album Golden Hour. She also picked up a win for Best Country Album. In her heartfelt acceptance speech, Musgraves became emotional noting that we’re living in a tumultuous time right now and because of that, “art is really thriving” adding, “I would have nothing without songs. For me, it’s just all about the songs.” She went on to thank her team, her husband, her little sister and her fans. Musgraves' big win made the No. 1 spot on our 2019 Grammys ranking. (Watch her full Album of the Year acceptance speech above).